A few months ago, we introduced you to Kesney Auguste and Haiti Medicine, IDA’s exclusive distributor in Haiti. In that blog post, Kesney shared his background and his ambition for Haiti Medicine: to be known as a reliable and effective partner that supplies quality medicines, provides excellent service, and creates jobs for Haitians. To help Kesney achieve these goals, IDA Foundation and Haiti Medicine partnered to sponsor a one-day conference in Port au Prince, Haiti. 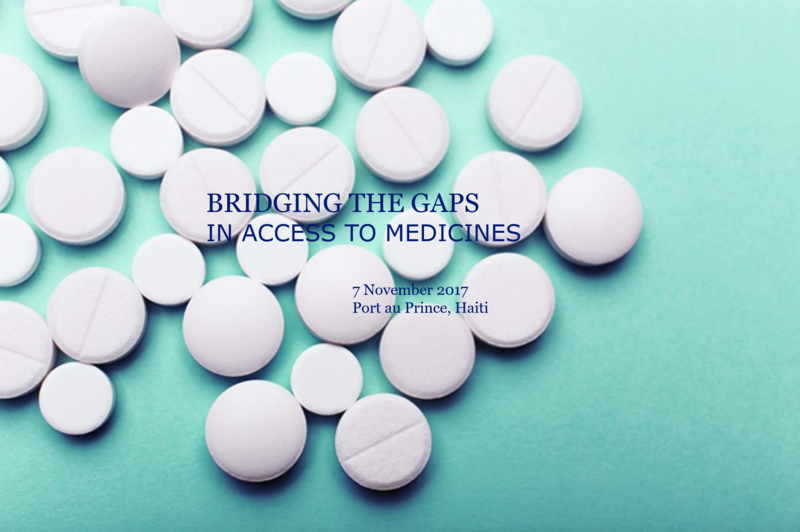 On 7 November, more than 70 participants gathered to discuss the conference theme, “Bridging the Gaps in Access to Medicines”. The attendees included hospital administrators, program managers, NGO representatives, physicians, pharmacists, and students. The morning program began with a presentation from Louis Martin, the CEO of Hôpital Albert Schweitzer in the Artibonite region of Haiti. Mr. Martin shared the background of HAS and some of the challenges that the hospital faces, including the increase in trauma patients due to traffic accidents – a tragic downside of improved road conditions. Dr. Minaud Dacius, the Haiti Program Manager for Vitamin Angels, spoke next. Haiti Medicine provides Vitamin Angels with storage and delivery of their donated vitamins, serving more than 65 institutions. To illustrate the importance of access to vitamins, Dr. Minaud presented compelling data about the long-term effects of childhood malnutrition. The cycle of malnutrition impacts education and limits economic development, contributing to Haiti’s continued poverty. The final speaker of the morning was Kesney himself. Kesney shared the history and mission of Haiti Medicine (HM), and provided the audience with information about the products and services available. Kesney stressed the unique value of Haiti Medicine: it offers IDA-quality products available in-country, for immediate delivery. For large hospitals or small medical missions, HM can serve as a trusted source of essential medicines and supplies. Conference participants networked over lunch, and then returned for the afternoon program. A round-table session tackled various questions related to access to medicines: product availability, forecasting, counterfeit drugs, budget allocation, and the role of technology in health. A robust and interactive discussion followed, giving participants the chance to share their experience and opinions. Throughout the day, new connections were made. Conference attendees appreciated the opportunity to talk about the challenges in their work, and to learn from others who are facing similar issues. The day after the conference, the Haiti Medicine team hosted an open house at their warehouse. They welcomed several visitors and shared more information about their logistics, distribution, and procurement services. On behalf of IDA Foundation and Haiti Medicine, we are grateful for the active participation of so many people, and we look forward to strengthening our relationships in Haiti! If you’d like to learn more about Haiti Medicine and the services that HM can provide to your organization, please contact Kesney Auguste directly. On the Haiti Medicine website, you can find the product catalogue, including all items currently in stock. If you’re based in Haiti, we invite you to arrange a visit to the HM warehouse.